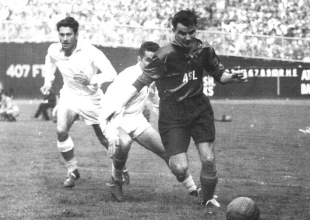 Photo: Benny McLaughlin playing with the American Soccer League All Star team against Hapoel of Tel Aviv in a friendly international game at Ebbets Field in New York on June 17. 1947 . The All-Stars won the match, which was televised, 2–0. Image from Wikipedia. Kensington-born National Soccer Hall of Famer Bernard J. “Benny” McLaughlin passed away on Thursday, Dec. 27, at the age of 84. A product of the famed Lighthouse Boys Club, McLaughlin graduated from Northeast Catholic High School in 1946. At Temple University, McLaughlin earned first team All American honors. McLaughlin began playing for the American Soccer League powerhouse Philadelphia Nationals in 1945. During his ten season career with the team, the Nationals won the ASL championship four times. The Nationals also won the Lewis Cup three times during that period, twice winning the league championship at the same time, or the “mini-double.” McLaughlin reached the final of the US Open Cup twice while with the Nationals. McLaughlin earned 12 caps with the US National Team and was on the squad that participated at the 1948 Summer Olympics in London. Selected for the US team that played in the 1950 World Cup, McLaughlin was unable to travel to Brazil because he could not get leave from work. McLaughlin left the Nationals to play two seasons with New York Brookhattan in 1955 before returning to play with Philadelphia’s Uhrik Truckers 1958-1960. Finishing his ASL career with New York Hakoah, McLauglin spent two seasons with New York German-Hungarians in the German American Soccer League. He joined local amateur club Vereinigung Erzgebirge of the United Soccer League of Pennsylvania for two seasons in 1963. Inducted into the National Soccer Hall of Fame in 1977, McLaughlin was also a member of the Northeast Catholic High School Soccer Hall of Fame, the Temple University Sports Hall of Fame, and the Southeastern Pennsylvania Soccer Hall of Fame. Our heartfelt condolences go out to McLaughlin’s family and friends. Thanks for the kind tribute Ed. Besides being such a memorable soccer legend, Ben was truly one of the kindest men ever. I had the pleasure of playing under him after I begged him to coach my women’s soccer team back in the 80s (he was my future father-in-law at the time.) While most coaches seek the win, Ben was all about the finesse and sportmanship of the game. He coached us all the way to the championship. I will truly miss him- he was a wonderful father(in-law). Thank you for the tribute to my father, Ben McLaughlin. He truly was one of the greatest soccer players of his time. He opened the door for many of these new and upcoming professional players. But most of all, my father wasn’t just about the game. He was an amazing man who had a gift for the game, but mostly a gift for life. He was the kindest man and the true meaning of “gentleman”. It was an honor to call him “dad”.